Rhode Island is a small state. The smallest state in the USA actually. Apparently, Rhode Island is compensating for its size complex by having the longest official name of any USA state though – State of Rhode Island and Providence Plantations – so put that in your back pocket for your next pub trivia night!! Rhode Island – I’m using the abbreviated name now – is only 1,214 square miles. That’s tiny! There are 11 CITIES that are larger than the entire state (including Houston, Nashville, Phoenix, Jacksonville, Anchorage, and Oklahoma City). Los Angeles is one square mile smaller than Rhode Island. Think about that for a minute. It ain’t big. In spite of the small size of Rhode Island, Providence is not the only major city in the state. Newport, in the southeastern corner of the state, is also well known. Newport is about 40 miles away from Providence and roughly 75 miles from Boston. 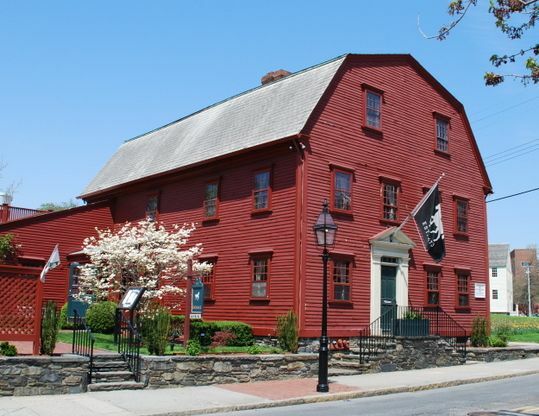 Newport is one of the oldest cities on the east coast, having been founded in 1636. As a result, it is full of historic buildings, houses, and cemeteries. In fact, the oldest bar in the entire United States is located in Newport. The White Horse Tavern, founded in 1673, is still here and still open for business! So at that same pub trivia night where you impress with your knowledge of long state names, you know the state with the oldest tavern is in the same state with the longest name! The White Horse Tavern was over 90 years old when the second-oldest tavern in the USA (The Fraunces Tavern in NYC) opened. To put that date into perspective, 1673 is the year the first European explorers entered the mouth of the Mississippi river to start exploring and New York was was still a Dutch colony called New Nederland. Put another way, for any Millennials reading this, that was 319 years before text messages were invented. Newport’s claim to fame is not the age of its taverns, however. It is the presence of the famous Gilded Age mansions built by the 1% of their day. Mark Twain coined the term “the Gilded Age” and it wasn’t a compliment. He was referring to the massive income inequality and gap between the rich and poor,all covered by a thin gold film hiding the problems. Glad that’s not a problem today. 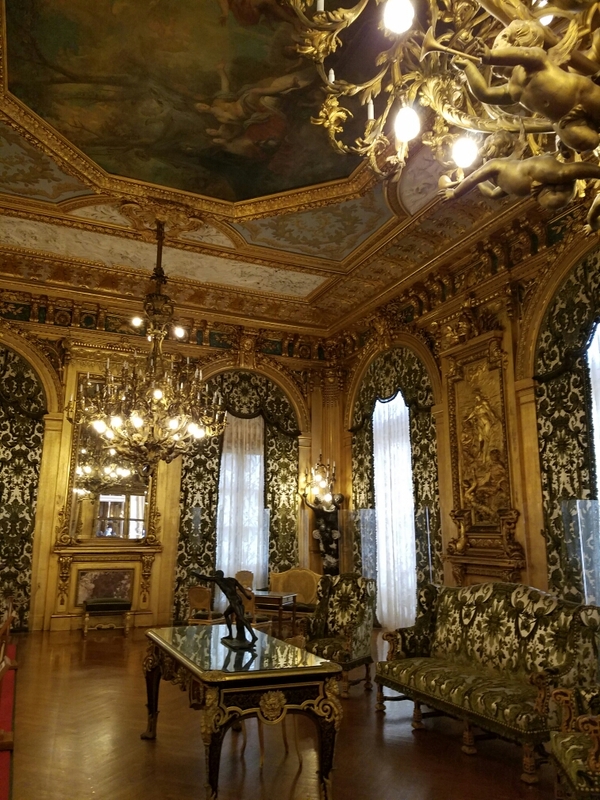 Also the gilded age was a reference to the fact that the rich of the era were fond of decorating with gilded items. 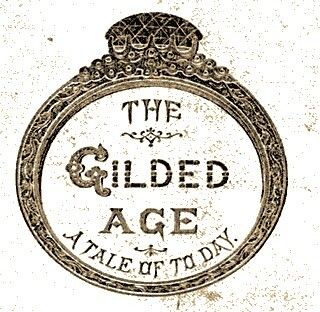 The Gilded Age was roughly from 1870 to 1900, although some argue it lasted up until the start of the Great Depression in 1929. The American economy of this time was rapidly expanding, particularly in manufacturing and railroads. This economic expansion created mega millionaires with names we still know today. Vanderbilt. Rockefeller. Carnegie. Mellon. JP. Morgan. Stanford. Guggenheim. The wealthy elites adhered to a social code dictating how their enormous fortunes must be spent. That code included the acquisition of property which displayed not only the wealth of the owner but did so in a very particular way. At this time, American Industrialists were very (newly) wealthy but they lacked the titles and pedigree of their European peers. 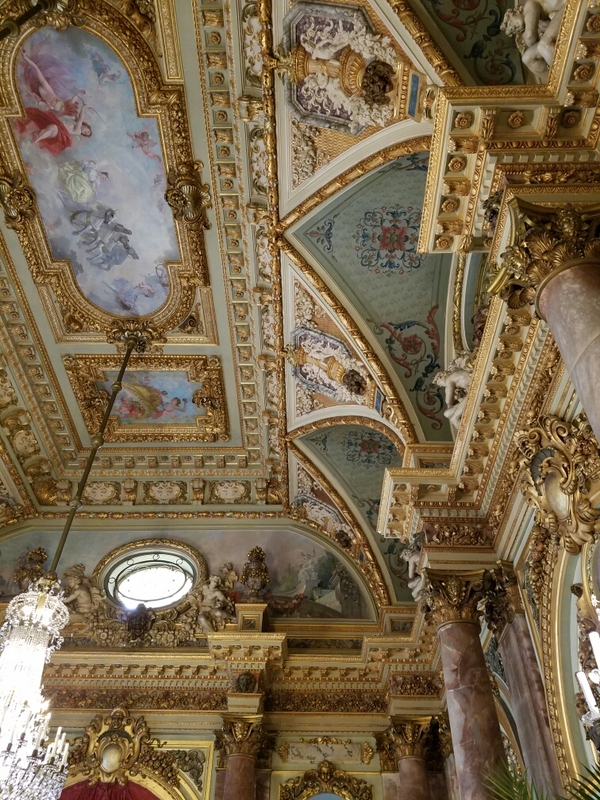 So they sought to reproduce the opulence and grandeur that they had seen in European castles, chateaux, and villas, trying to show they had their own nobility. Consequently, Newport became the one of the main locations that the rich chose to build these incredible summer “cottages” (never homes) where they entertained each other. For only 12 weeks each year. That’s right. These buildings you are about to see were only used for a small part of the year. Mostly for parties. Its good to be rich! 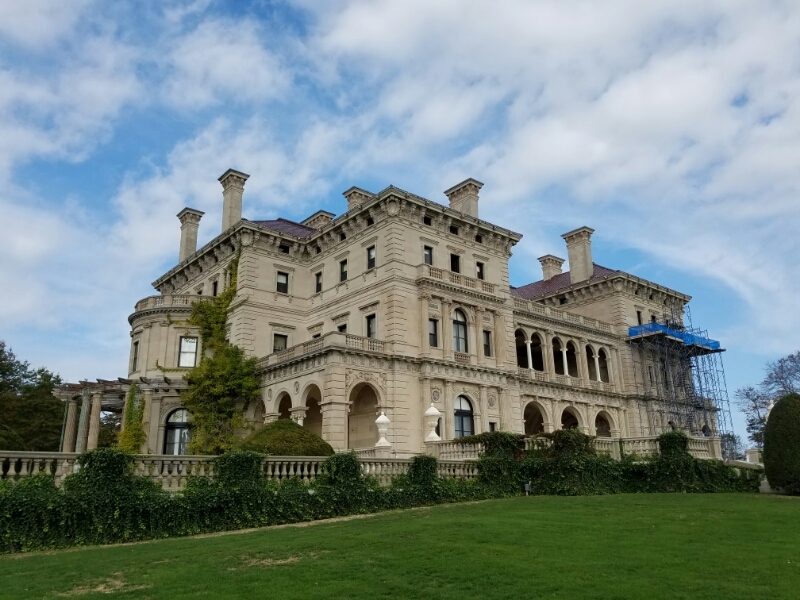 The Breakers was built for Cornelius Vanderbilt, the uber-wealthy railroad tycoon. It was finished in 1895 and upon completion it became the largest of the Newport Mansions. 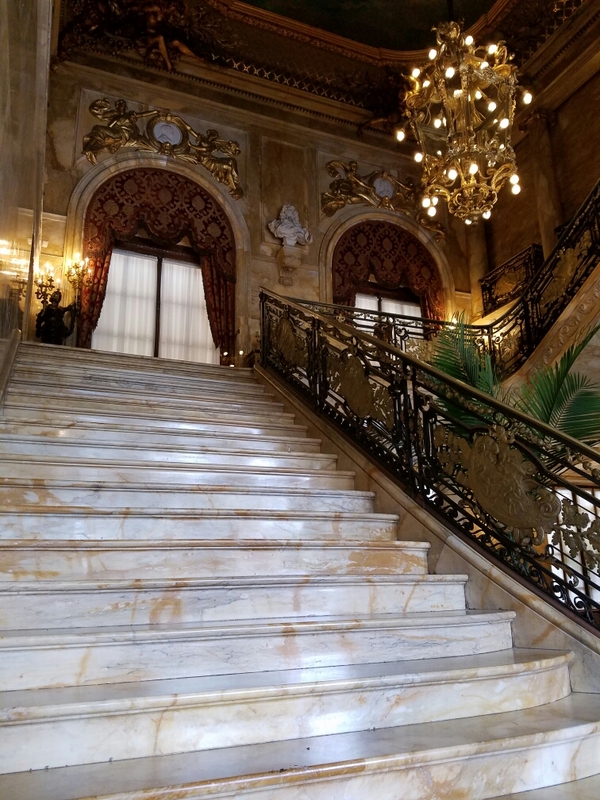 The Breakers is over 125,000 square feet of space – 62,000sq feet of living space – with 70 bedrooms spread across 5 floors. 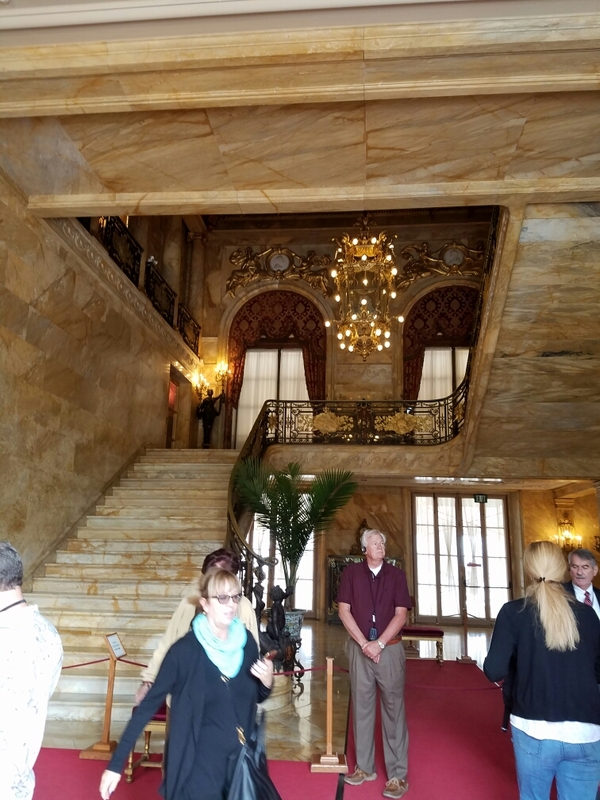 Vanderbilt was deeply afraid of fire so the Breakers is built with solid materials including marble, granite, concrete, and steel. He even required the boiler to be located away from the main building (it is buried below the front lawn). 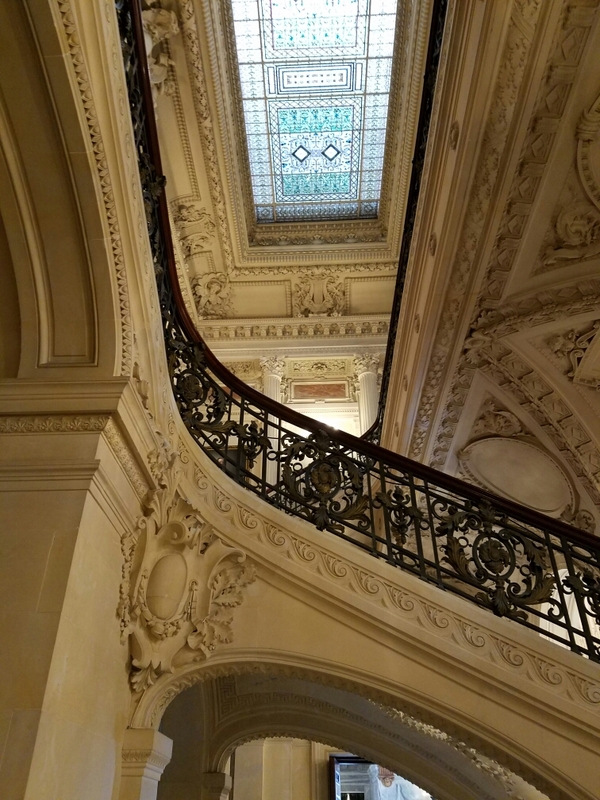 Imported materials were used heavily including marble from Italy and Africa, rare woods from around the world. The interior rivals anything seen in Europe or the finest hotels of the day. While it looks a bit like a Vegas casino, all of the craftsmanship is authentic as are the materials. 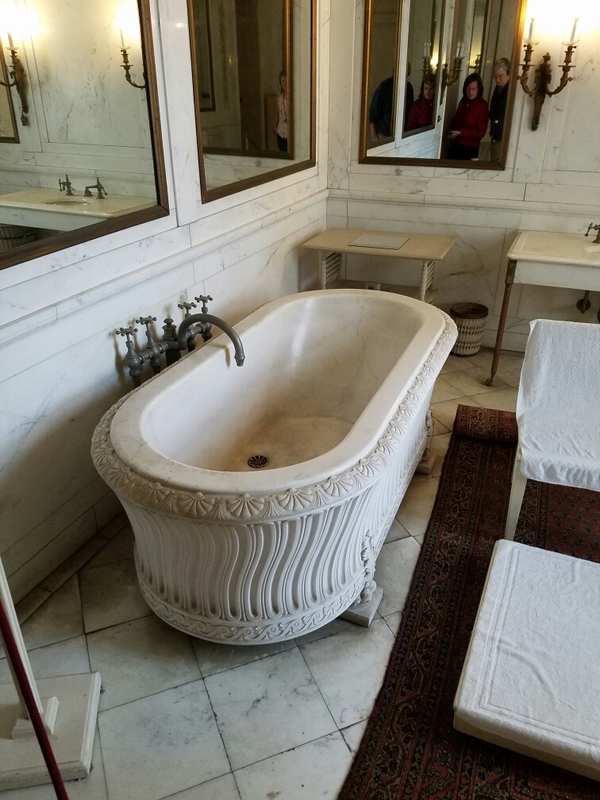 The Breakers has the best of everything including this hand-carved marble bathtub with faucets for hot and cold running water….and hot and cold running SEAWATER. Saltwater baths were supposed to be stimulating and so of course Mr. Vanderbilt needed the option to have that piped in. 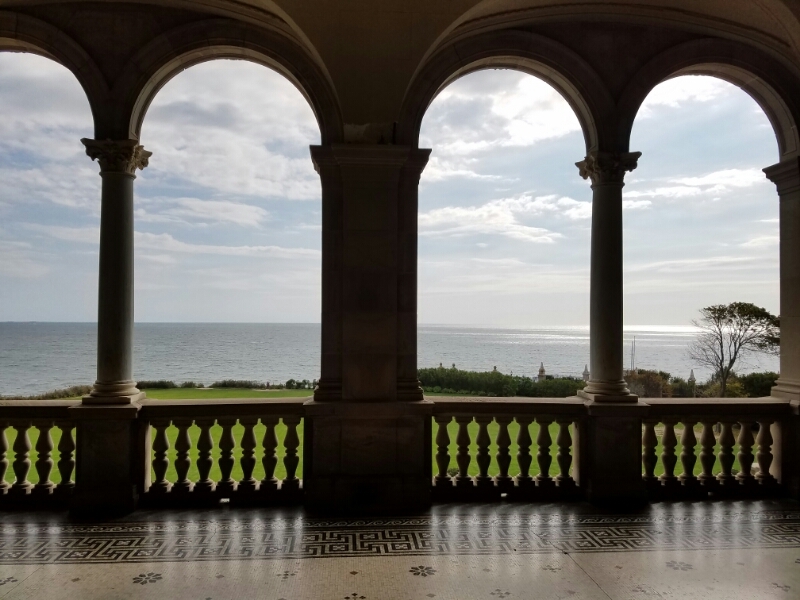 The view off the main ballroom is stunning, looking out over the Atlantic Ocean. Remember – these are temporary residences meant for entertaining. As summer set in, the wealthy descended on Newport to throw extravagant balls and cotillions for each other. Consequently, the houses are primarily designed for entertaining. Of the 70 bedrooms in The Breakers, 65 of the bedrooms are used for staff and only 5 for the owners. That’s important to keep in mind. The houses were supposed to run “as if by magic” meaning that a small army of servants kept the house operating but were rarely seen. Dishes quickly cleared themselves and reappeared in the china cabinets washed and ready for the next meal. Food was always stocked (delivery entrances were hidden from all view). Floors were always clean. Furniture was always dust-free. Linens were magically fresh on the beds…which made themselves. Fresh clothes were somehow magically set out at the right times. That last bit is important as the dress code of the period dictated as many as five different outfits PER DAY. Someone described living in this time as part of the upper society was like in being a cast member in a day-long play, with costumes changed for each act. 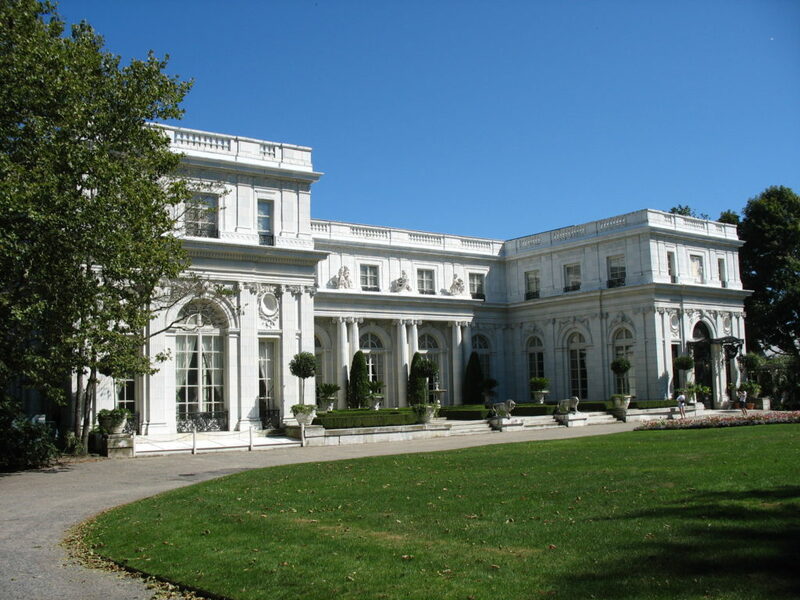 Just down the street from the Breakers is Rosecliff. 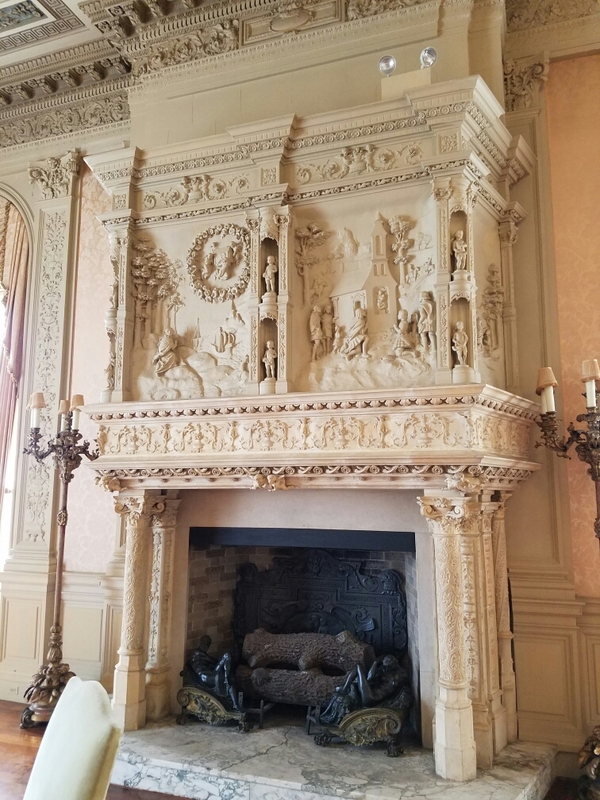 Rosecliff is just as detailed inside as the other mansions, with hand-carved items everywhere. 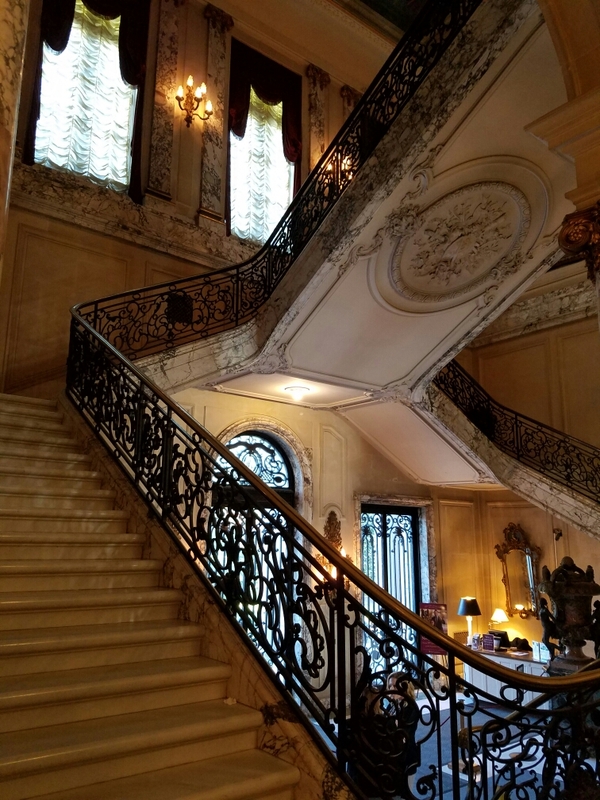 Rosecliff has a grand central staircase where the owners could descend to make their appearance for their party guests. Today, the mansion is the venue for many weddings and is generally booked each weekend. If you want to get married here, book in advance. Rosecliff has a sad story. Its owner was Theresa Fair Oelrichs, wife of Hermann Oelrichs. Hermann was one of the original 4 partners in the Comstock Lode, the rich sliver mine in Nevada. She and her husband soon parted company but never divorced, and unlike many of the Newport mansions Theresa lived here much of the year. She threw herself deeply into the Newport social scene and was the hostess of lavish parties with important guests. Sadly, public opinion turned against the excesses of the wealthy and Newport mansions fell out of favor in the early 1900s. By 1905, party season in Newport had ended for good. Theresa never recovered, and spent her last few years at Rosecliff wandering the empty house hosting parties for imaginary guests. She died in 1907. Rosecliff fell into disrepair. It traded owners, one of whom bought the house for her daughter for the paltry sum of $20,000. The daughter left as fall descended, not winterizing the house. Pipes froze, and when they thawed they flooded the house – including that amazing ballroom – under six inches of standing water. 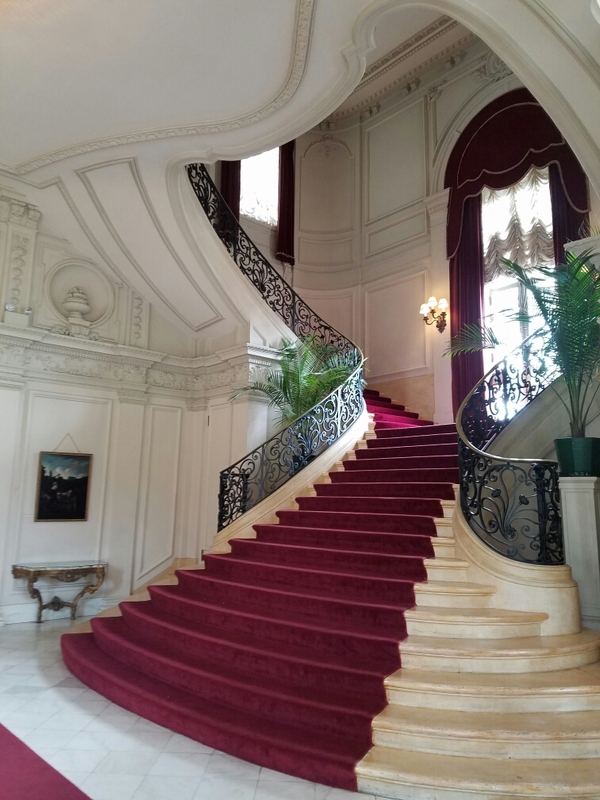 Rosecliff was eventually purchased by the Monroe family, a wealthy businessman from New Orleans. They brought new life to the property and resumed entertaining with their purchase in 1947. They didn’t care that the Newport mansions were unfashionable and continued hosting Mardi Gras -themed parties until the late 1960s. In 1972, they donated the property to the Newport Preservation Society. 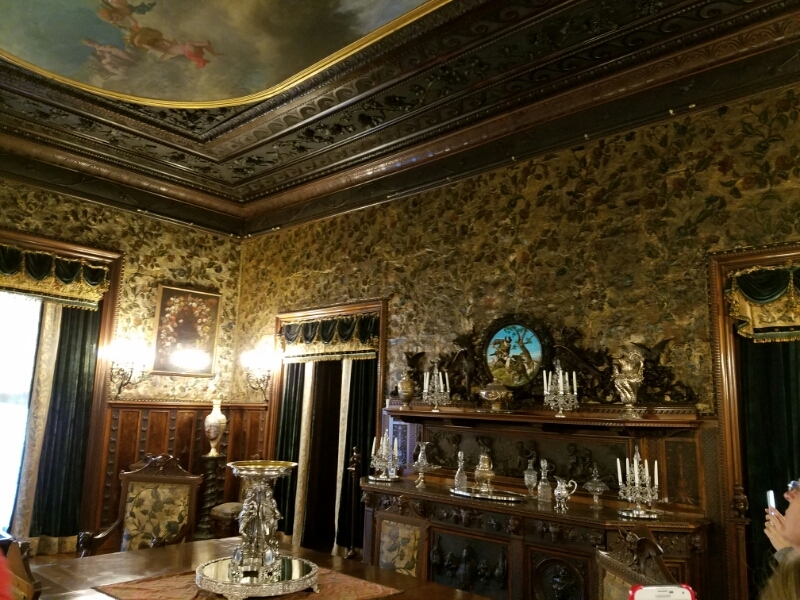 Newport Preservation Society had begun buying the old mansions and preserving them as historical treasures. It seems that by the 1920s, the mansions were seen as vulgar, gaudy, tacky, and trashy buildings with no historical or architectural value. Developers often bought the buildings, demolishing them and erecting apartment buildings or parking lots. This was the fate of many iconic Newport properties. Fortunately some have been preserved by the Newport Preservation Society and are now open to the public. 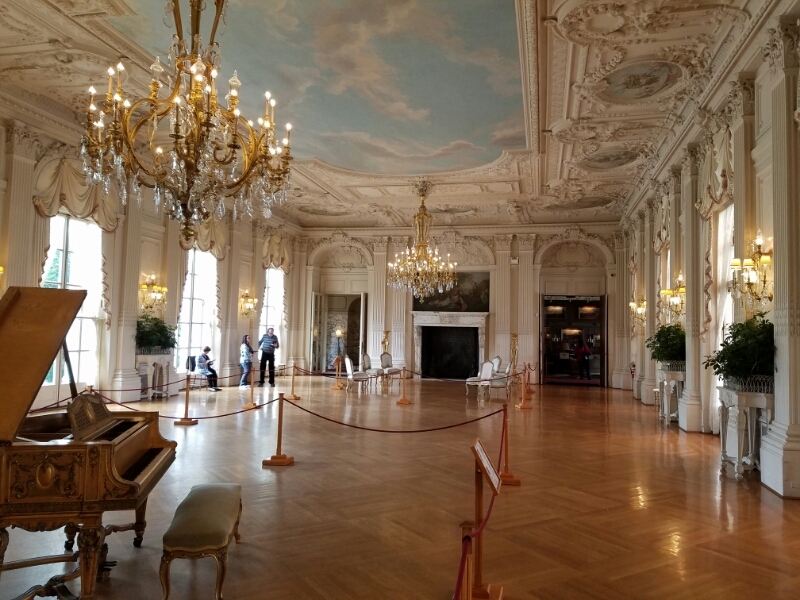 Obviously The Breakers is impressive, but Marble House is equally over the top. 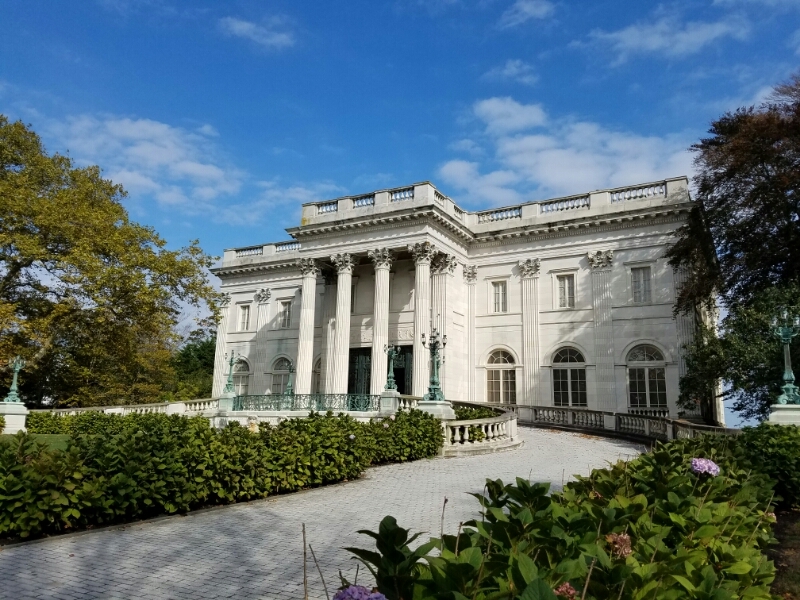 Marble house was built for Ava Vanderbilt as a 39th birthday gift from her husband William Vanderbilt. 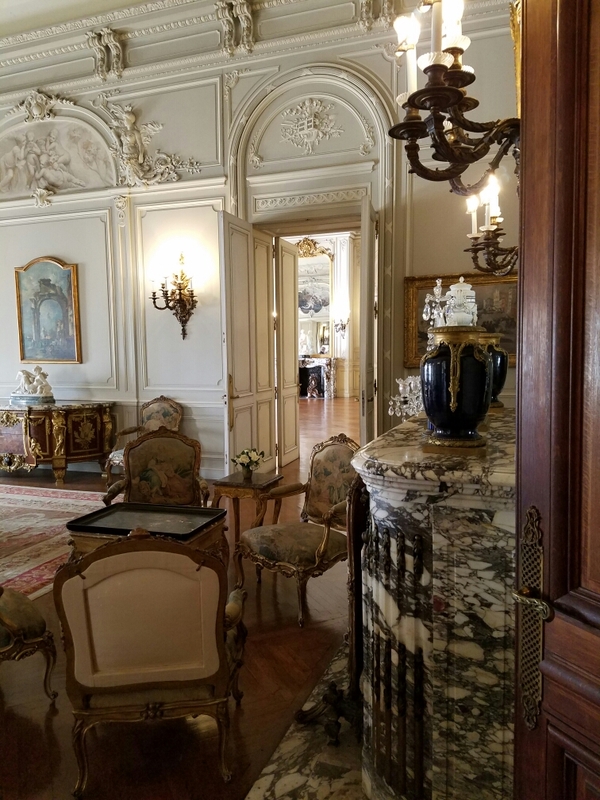 The front of Marble house resembles the White House but the interior is completely different. 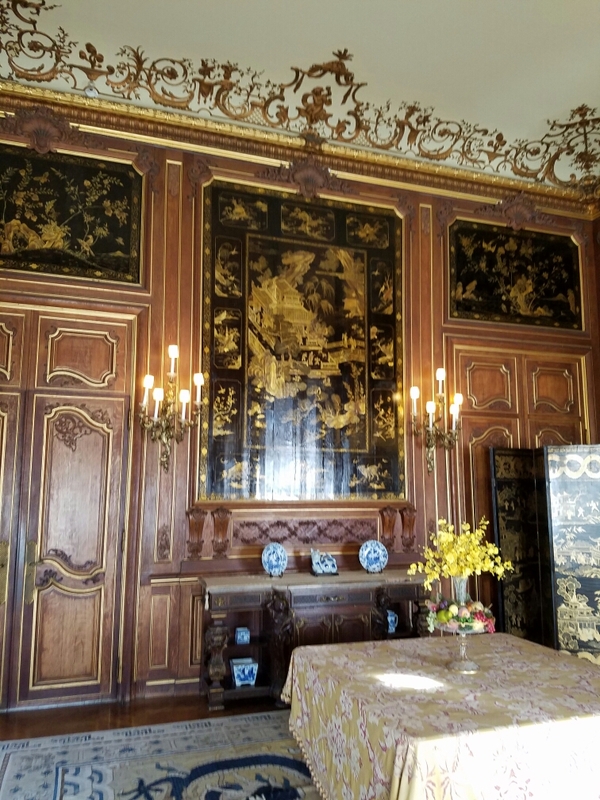 50 rooms make up the interior, although like other Newport mansions only 6 of those rooms are bedrooms for family and guests (5 family 1 guest). The rest house the nearly 40 servants, cooks, butlers, maids, footmen, and other workers. 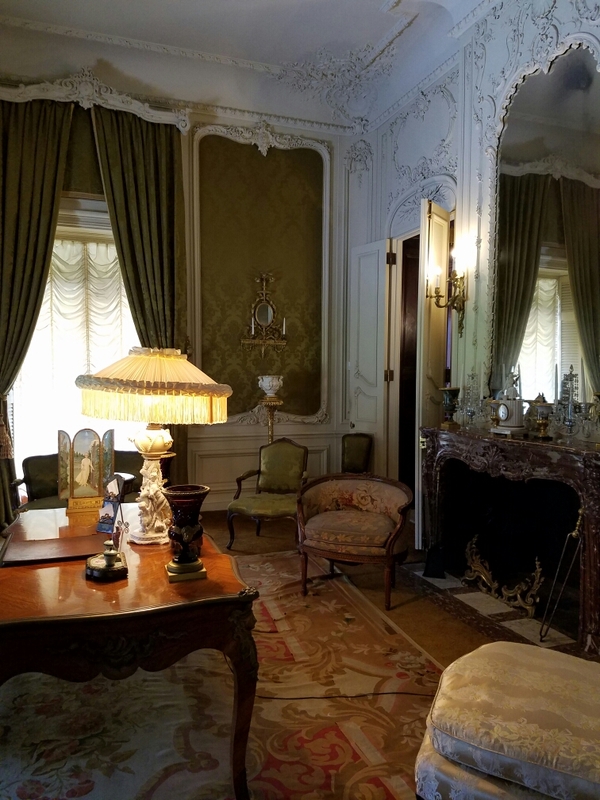 What sets Marble House apart from the other Beaux-Arts buildings is the interior. 500,000 square feet of warm yellow marble covers nearly every surface. 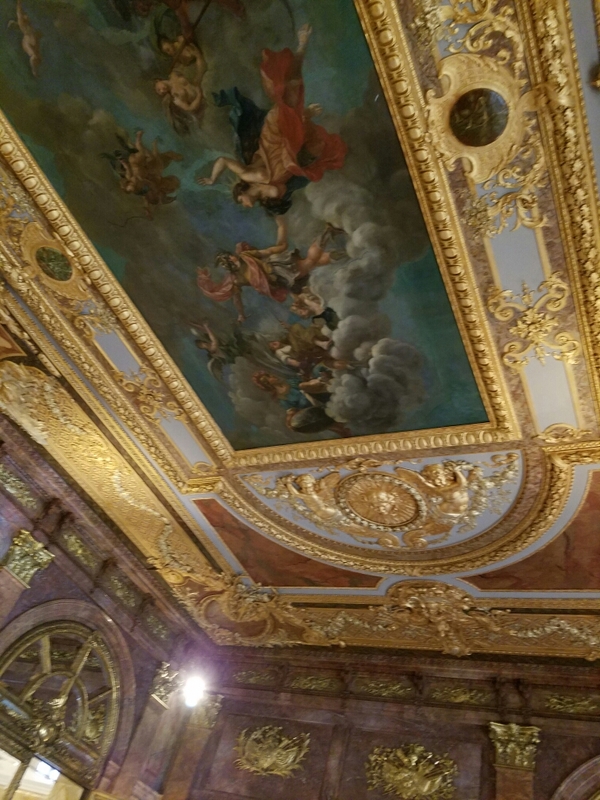 The surfaces which are NOT marble are just as ornate, with gilded frames around ceiling paintings that span entire rooms. Marble House rivals any of the castles and chateau I have seen in the UK or France. As was its intent. Another spectacular mansion is the Elms. Finished in 1901 and modelled after a French chateau, the Elms was owned by the Berwind Family. The Elms is notable for several reasons. First, Edward Berwind (who made his money in coal) was very interested in technology so the Elms was one of the first homes in America to be wired completely for electricity with no backup. 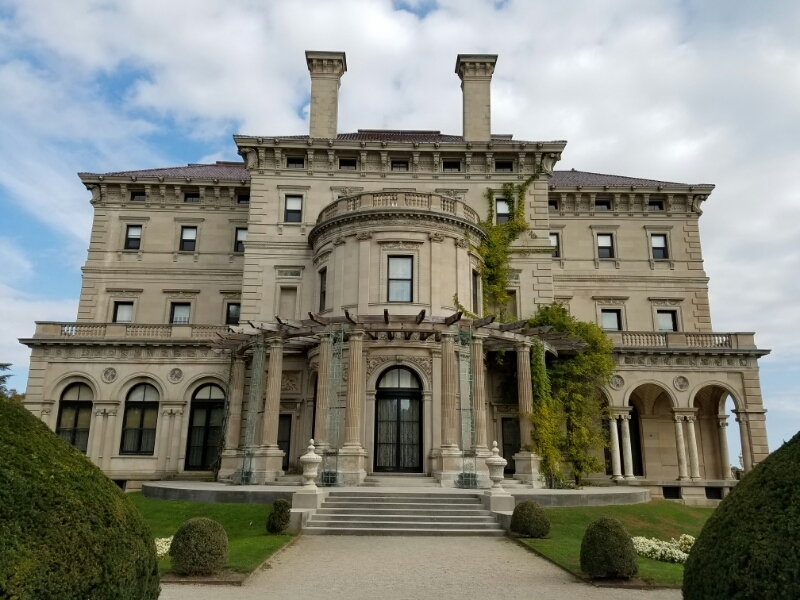 The Breakers, Rosecliff, and Marble House all had electrical wiring as well, but had redundant gas systems in case the electricity failed. Since the lighting was entirely electric, Berwind had one of the first residential electric ice makers installed. Other houses still relied on ice cut from frozen ponds which was delivered by the ice companies to the houses. Berwind only visited on the weekends, and not most of the weekends. The bathrooms give a taste of the wealth and expense. 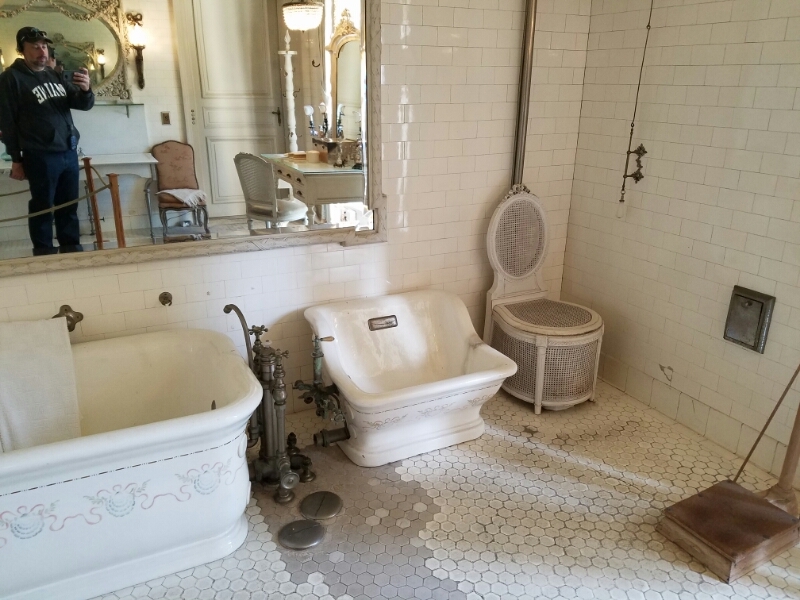 At a time when most American houses had no running water, the Elms had custom hand-woven toilet cases. 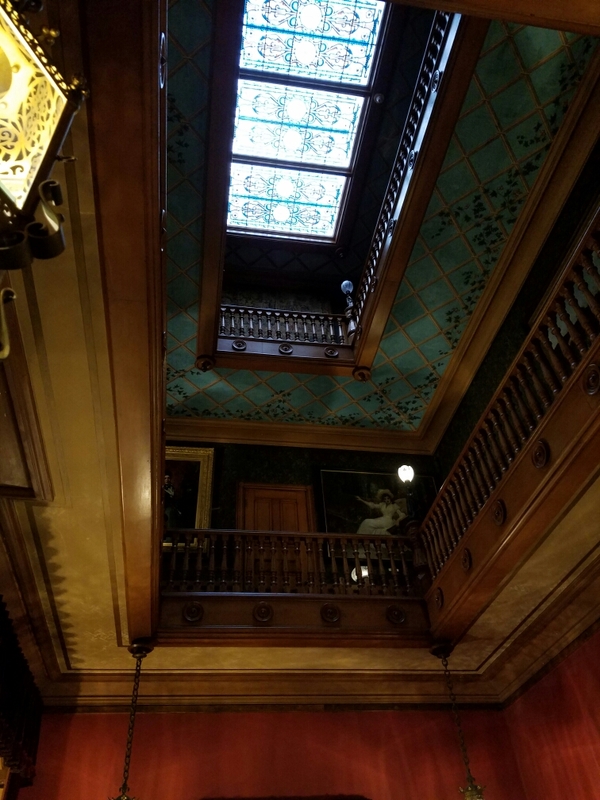 The Elms was the only gilded age mansion to have an indoor atrium with fountains and tropical plants. 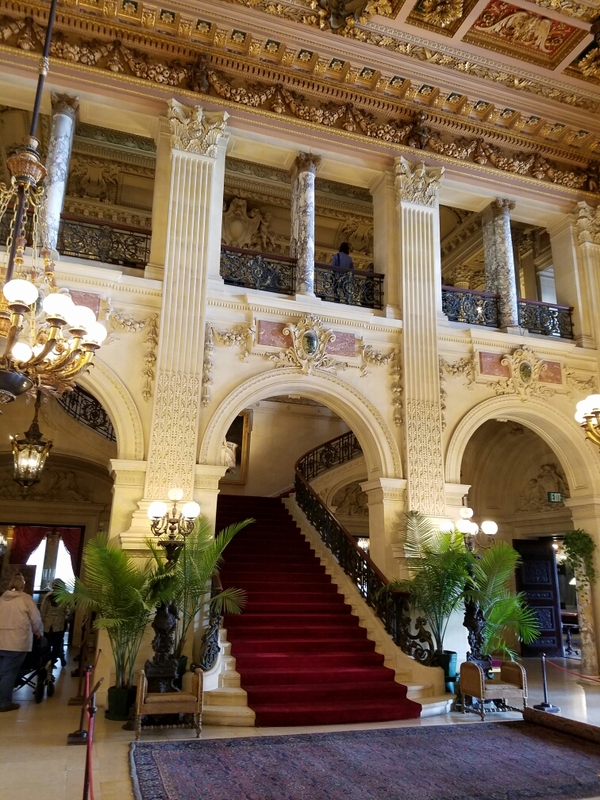 The grounds were modelled after a French chateau and were considered the most ornate in all of Newport. 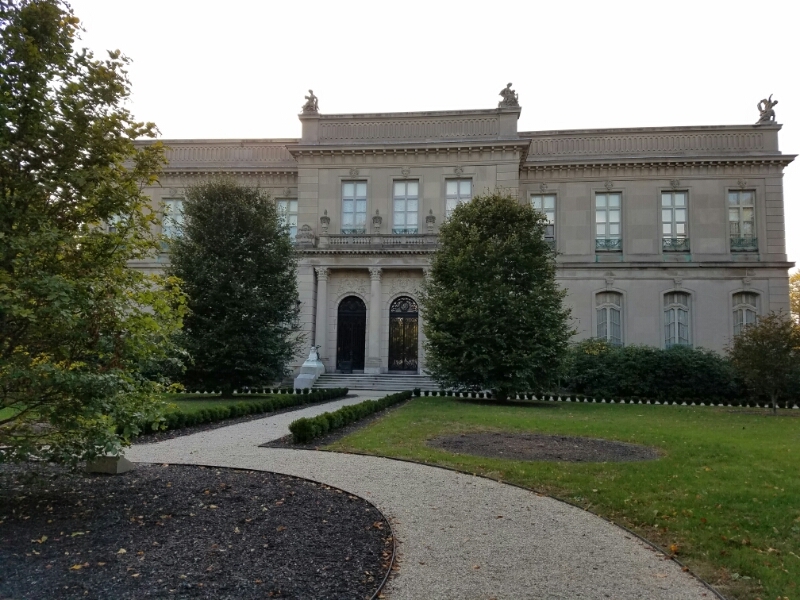 Like other Newport homes, the Elms was put up for auction and was expected to become a parking lot. The Preservation Society purchased it and has added it to their collection. One interesting house that is somewhat different is the Chateau Sur Mer. This home was lived in year round by the Wetmore family. 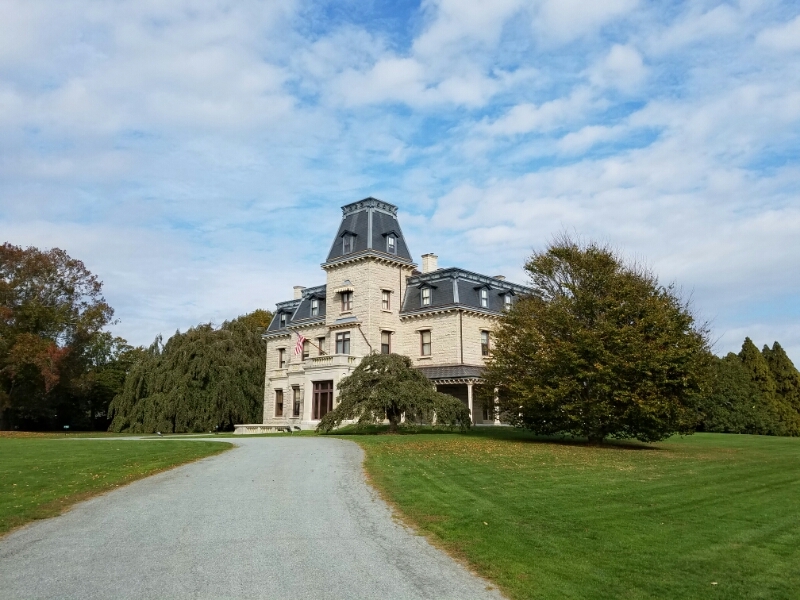 Built in 1852, it was the most impressive house in Newport until the Vanderbilt houses of the late 1890s. To me, the house looks like it belongs in the Addams Family lineage. And that’s just the exterior. 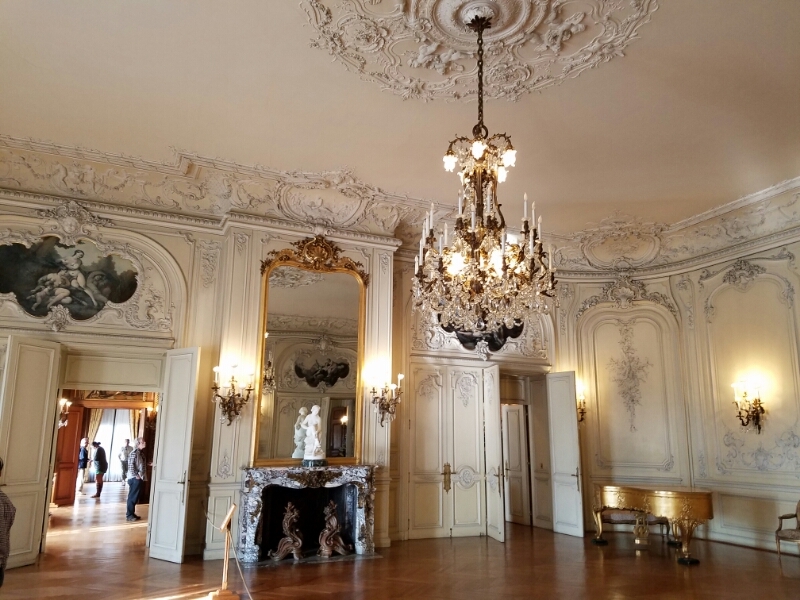 Unlike the other Beaux-Arts mansions, Chateau-sur-Mer is dark and choppy inside. It could easily stand in for Disney’s Haunted House. 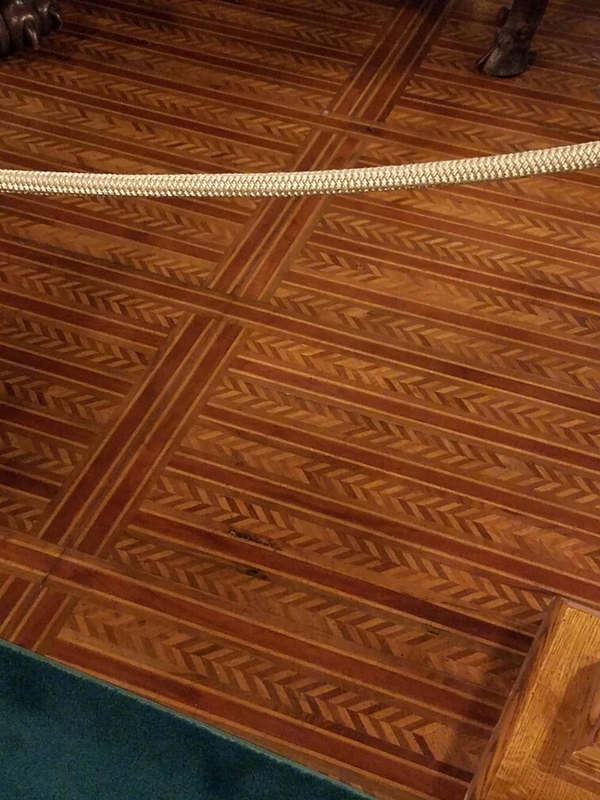 Its floors were wood – not marble. Very ornate though, as you can see in the photo below. The interior is quite dark, partially due to the lack of large windows and partially due to the choice of colors. 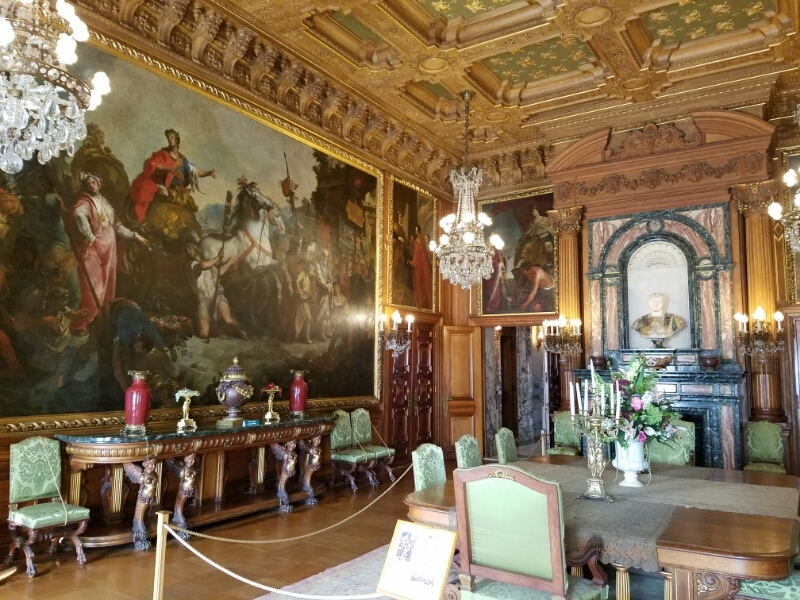 Dark brown wood, green wallcoverings, and lots of leather dominate the decorating of Chateau-sur-Mer. 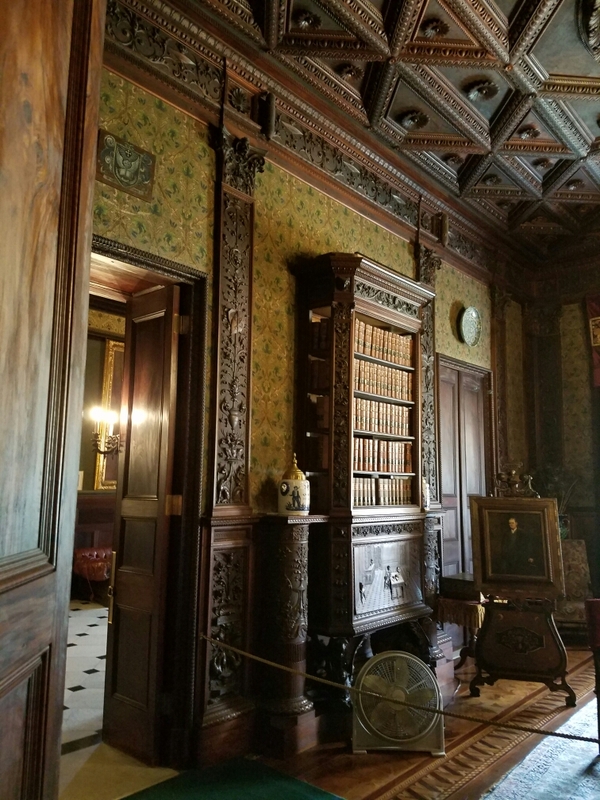 As a year-round residence and a home, it was not designed as a party palace the way other Newport mansions were. It was also built almost 40 years earlier than those other buildings. Much of the families original furniture and decorating are still here. The descendents of the family actually lived here until the last owner passed away in 1967. The house was put up for sale and the Preservation Society purchased it in 1969. Because of the history, many of the rooms remained untouched for over 50 years, having been basically closed off and abandoned by the family. Due to this, they were like miniature time capsules! We toured 5 mansions, which took most of the day. Chateau-sur-Mer is very different than the others, a little creepy by day and I’m quite sure I would not want to spend a night there. But all were over-the-top spectacular. 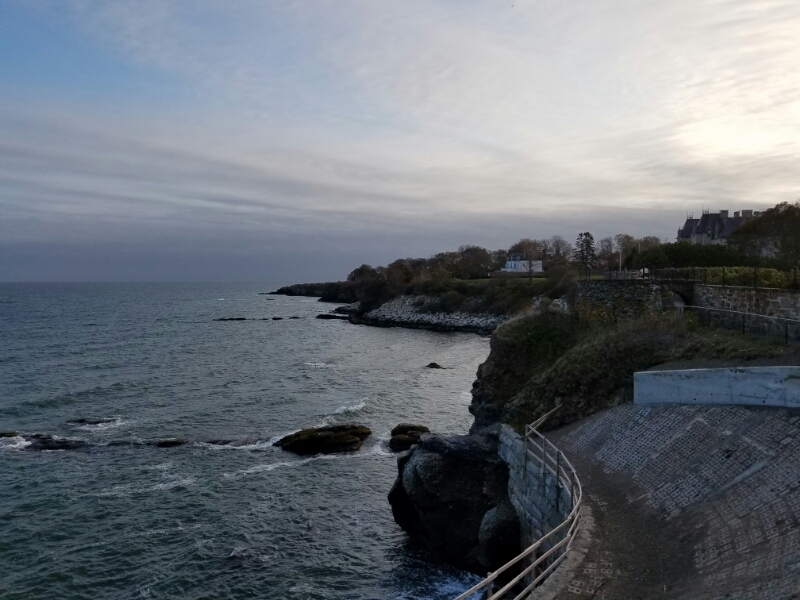 The city has constructed a walking trail along the seacliffs behind the mansions called – wait for it – Cliff Walk. Cliff Walk is well worth the time, traversing a seacliff that looks more like central California than other East Coast oceanfront we have seen. Honestly it is worth a trip way out of your way to go to Newport. 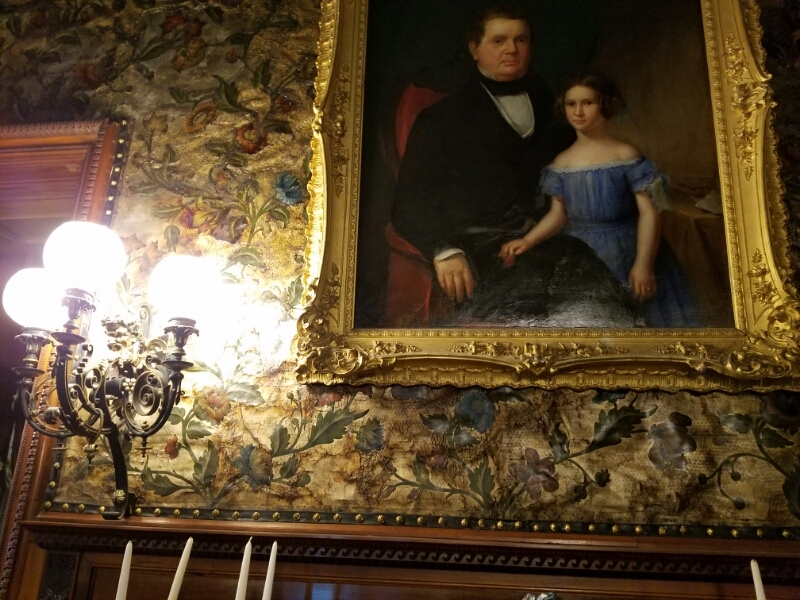 In addition to the mansions, unique in the USA, there is so much history in Newport that it is worth the trip.